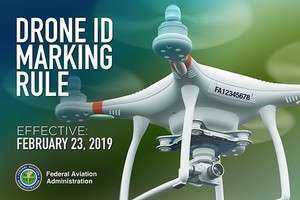 FAA makes major drone ID marking change » UAV DACH e.V. 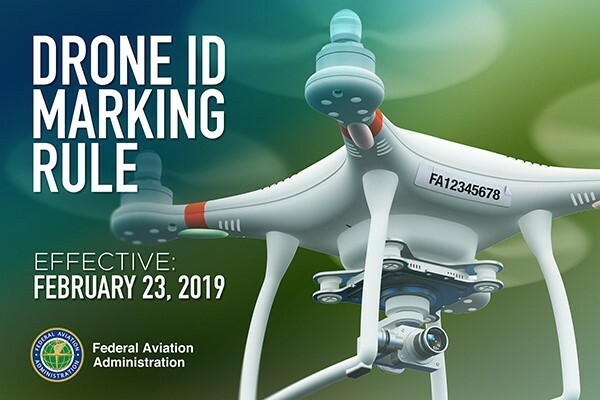 The Federal Aviation Administration (FAA) has posted a rule in the Federal Register requiring small drone owners to display the FAA-issued registration number on an outside surface of the aircraft. Owners and operators may no longer place or write registration numbers in an interior compartment. The rule is effective on Feb. 23. The markings must be in place for any flight after that date. The FAA has issued this requirement as an interim final rule—a rule that takes effect while also inviting public comment. The FAA issues interim final rules when delaying implementation of the rule would be impractical, unnecessary or contrary to the public interest. In this case, the agency has determined the importance of mitigating the risk to first responders outweighs the minimal inconvenience this change may impose on small drone owners and justifies implementation without a prior public comment period. As stated last month by U.S. Transportation Secretary Elaine Chao, the FAA has now posted proposed new rules to let drones fly routinely at night and over people and to further integrate them safely into the nation’s airspace. The comment period for these proposals begins tomorrow and will end April 15. Beitrag im Original auf http://uasmagazine.com/articles/1985/faa-makes-major-drone-id-marking-change, mit freundlicher Genehmigung von The UAS Magazine automatisch importiert. Original in englischer Sprache. Der Beitrag gibt nicht unbedingt die Meinung von UAV DACH e.V. wieder.